I prepared this chicken recipe for dinner one night. It was easy to prepare and I loved the fact that the ingredients were minimal. 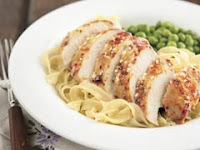 I served the chicken with buttered egg noodles and green peas. Place all ingredients in a large resealable plastic bag; seal bag. Turn bag over several times to evenly coat chicken with remaining ingredients. Lay flat so chicken does not overlap. Refrigerate chicken 30 minutes to marinate. Preheat oven to 425 degrees. Remove chicken from marinade; discard bag and marinade. Arrange chicken on a foil-covered baking sheet. Bake chicken 20 minutes or until cooked through (165 degrees).